Over the past few decades, dental implants have quickly become the most popular and trusted method of tooth replacement. Why? Unlike other treatments that only bring back the visible portion of the tooth, the crown, implants actually restore the root and crown. The end result is virtually indistinguishable from nature, and at Woodside Dental Care, we can now use them to completely rebuild your smile. No matter how many teeth you are missing, implants can turn back the clock and dramatically improve your oral health and appearance at the same time. Want to know if you’re a good candidate for this treatment? Just give us a call today to schedule a consultation in our dental office serving Assonet and Freetown. 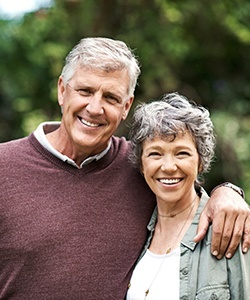 Why Choose Woodside Dental Care for Dental Implants? Stability: A dental implant uses a small titanium post placed directly into the jawbone to mimic the root structure of a lost tooth, and this can then be used to support a restoration/crown that shows above the gumline. Because implants are anchored within thick bone, patients don’t have to worry about their new teeth slipping or coming out no matter what they are eating. Aesthetics: Dental implants are capped with porcelain restorations and have no metal clasps or attachments, helping them blend seamlessly into any smile. Bone Retention: Bone loss is inevitable after tooth loss, but implants actually stimulate the bone and prevent bone resorption, maintaining the overall shape of the face. No other treatment can do this! Longevity: With consistent oral hygiene and dental visits, an implant can easily be expected to last for more than 30 years. Pretty much anyone with missing teeth can benefit from dental implants as they can be used to support a variety of restorations. Which of the options below would be best for you? Our team can help you decide when you come to see us for a consultation. We can place a single dental implant into the jaw and top it with a custom-made crown. This new tooth won’t require the ones surrounding it to be altered in any way, helping preserve more of a patient’s natural smile. If a patient is missing three or more teeth in a row, instead of replacing each one with individual implants, just two can be used to support a bridge. 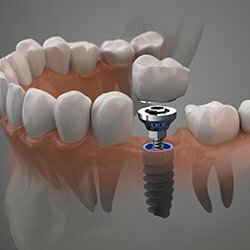 Two implant crowns will be positioned on either side of the missing teeth, and these will hold a prosthetic in place that literally “bridges” the gap. 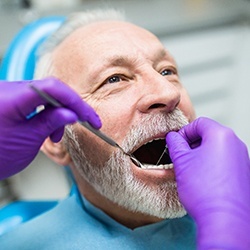 A denture can be secured to the gums using just four to six implants, giving it a hold, stability, and bite a traditional removable prosthetic simply can’t match. The cost of a dental implant procedure can vary quite a bit from person to person based on their individual situation. Factors such as: how many teeth a patient would like to be replaced, where they are located in the mouth, and what kind of restoration is used can all influence the final price. While implant restorations do tend to cost more than other traditional options, they are actually the best investment long-term. Regular bridges and dentures typically only last for about 7-10 years, while implants can often last for 30 or more. 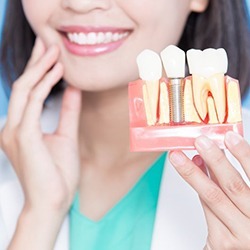 This means, with implants, a patient won’t have to spend money on periodic maintenance and retreatments, saving them thousands of dollars and hours spent in the dental chair.